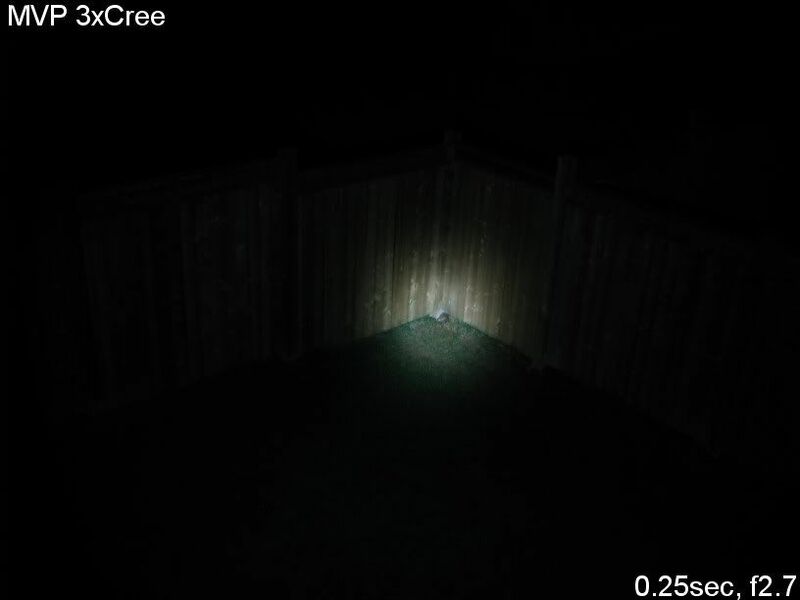 JetBeam M1X V2 Review (Cree MC-E): RUNTIMES, BEAMSHOTS, and more! 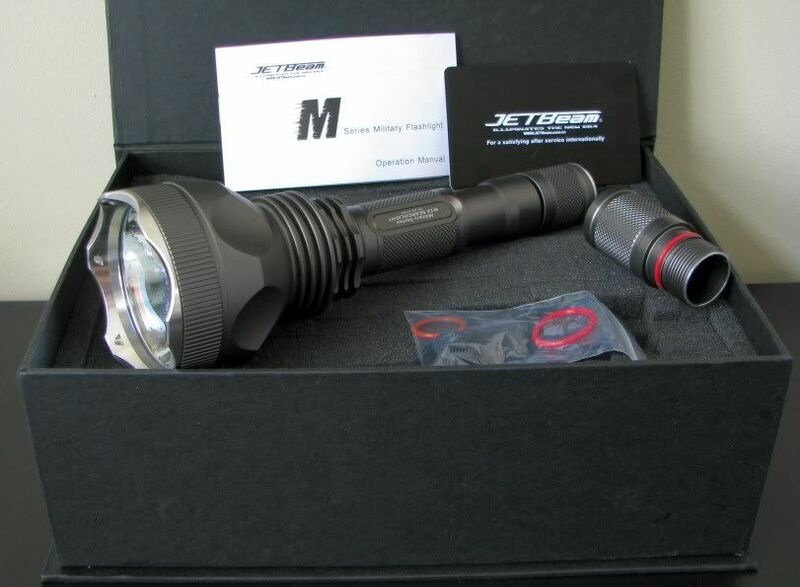 Reviewer's Note: The M1X was provided by JetBeam for review. UPDATE Oct 23, 2009: The comparison beamshots, summary table and runtimes have been updated to reflect some of the more recent competition in this space. Scroll down for details. 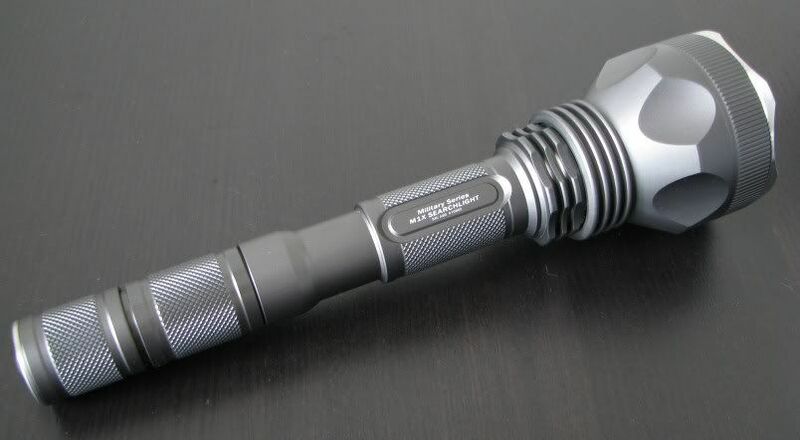 The M1X is JetBeam's attempt to produce a high-powered thrower searchlight with the new MC-E Cree emitter. This is different from a lot of manufacturers, who have typically tried to design reflector systems to emphasize the "floodier" nature of the quad-die Cree M-CE and SSC P7. A limited first batch of these were made and sold here earlier this year, but a revised final version is now in production (and reviewed here). The M1X comes in a large hard cardboard box with magnetic closing flap. Inside, in layers of cut-out foam, are the light, battery extender, instruction booklet, warranty card, extra o-rings and spare tailcap button cover. 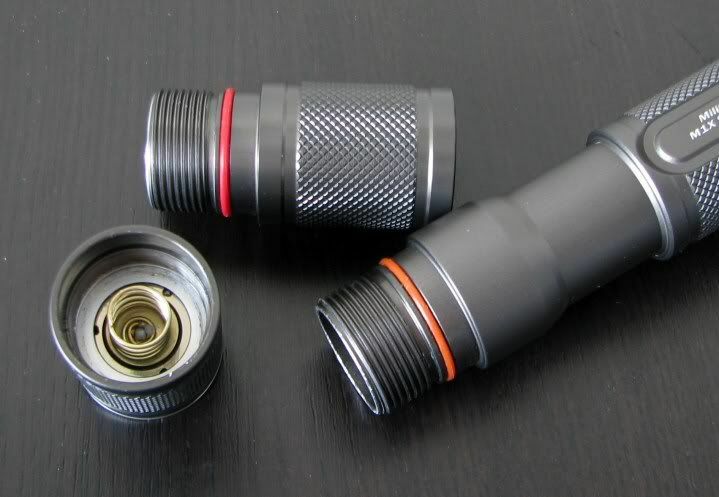 The overall shape and design is similar to other JetBeam lights, with typical JetBeam knurling and their classic natural finish type-III (hard anodized) anodizing. The lettering is very sharp and clear on my sample (better than typical for JetBeam, to be honest). The stainless steel bezel ring features mildly scalloped edges - a style I hope JetBeam continues for its other lights. 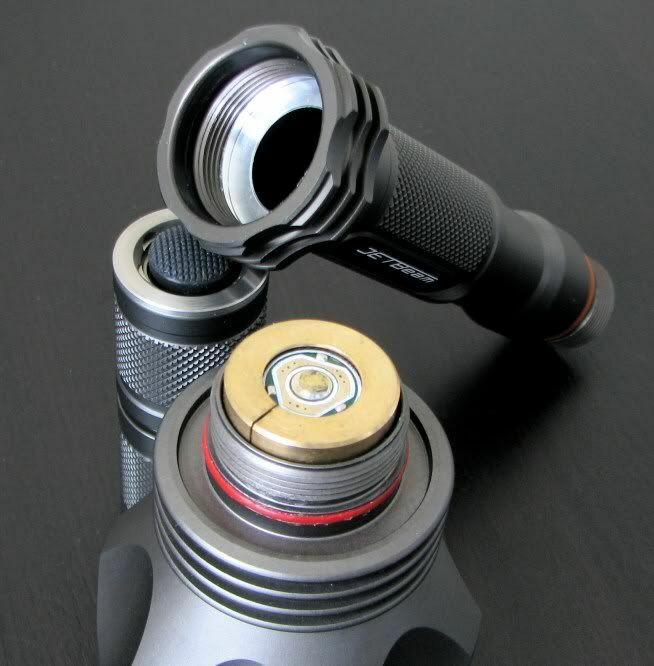 The M1X comes with a protruding forward clicky tailcap switch with a good feel. Seems similar to the Jet-III M. Note the all-metal construction inside (i.e. no more plastic retaining rings). Screw thread action is smooth on all sections, although my sample came with virtually no lube. 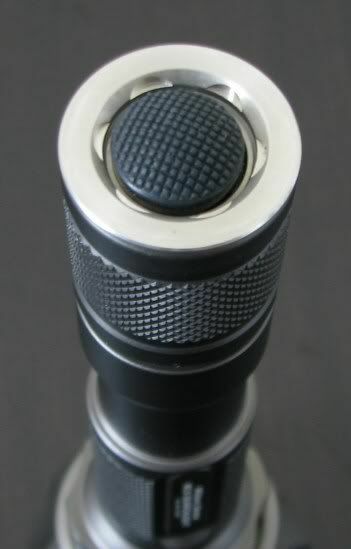 Note the M1X lacks the square-cut screw threads of the Jet-III M. They are however anodized, so tailcap lock-out is possible. Tailstanding is not possible. Note the brass contact ring on the inside of the head - this presumably allows switching between max output (head tightened) and the user-defined mode (head loosened). See below for a discussion of the User Interface. I'm actually quite impressed by the design. Unscrew the bezel retaining ring, remove the lens, remove the o-ring gasket, and the emitter/pill and reflector combo come out as one unit. You can then unscrew the emitter/pill from the reflector (there's even an o-ring on the reflector unit). Feels very well made. The M1X has a surprisingly deep orange peel reflector. In fact, it seems to have two distinct phases - a very steep drop-off near the reflector, and a more traditional slope in the front 2/3rd of the reflector. 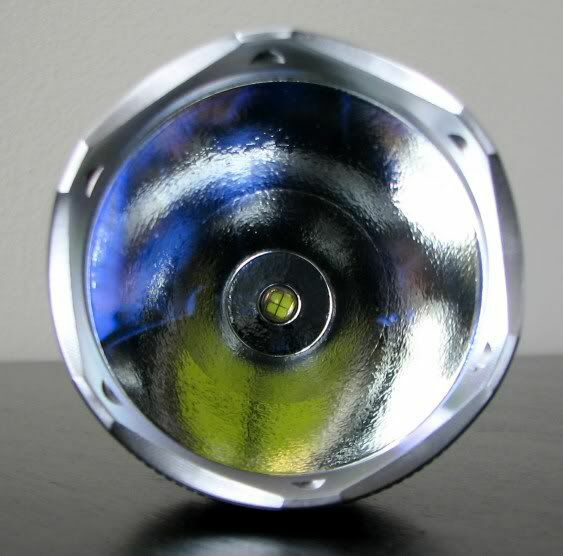 This unique design is presumably to maximize throw with a quad-die M-CE reflector. The lens has a definite anti-reflective coating - you can see the blue-tinge in the pics above and below. Here's how it look in my hands (FYI: I have relatively narrow and long fingers). 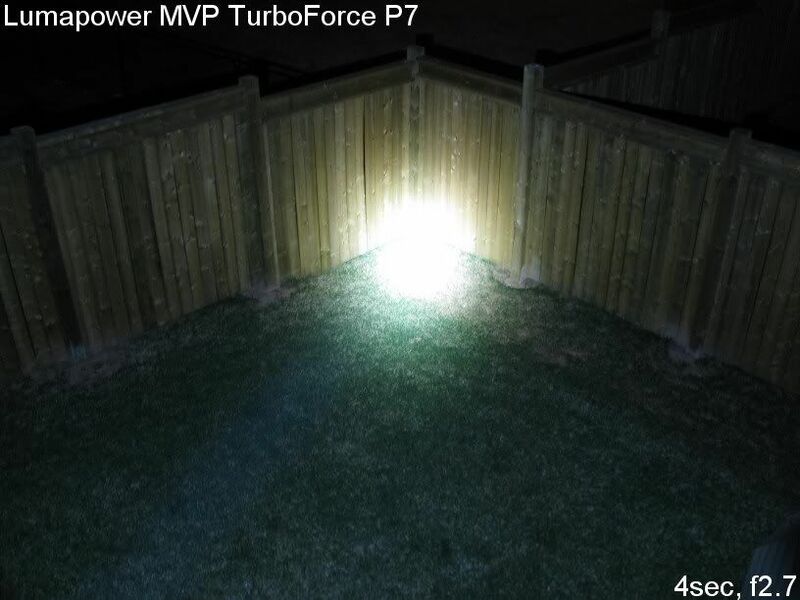 (from left to right, AW 18650 protected battery, JetBeam M1X, Tiablo ACE-G, Lumapower MVP TurboForce P7). The M1X features a similar interface to the Jet-III M (and other "broad-voltage" JetBeam offerings). 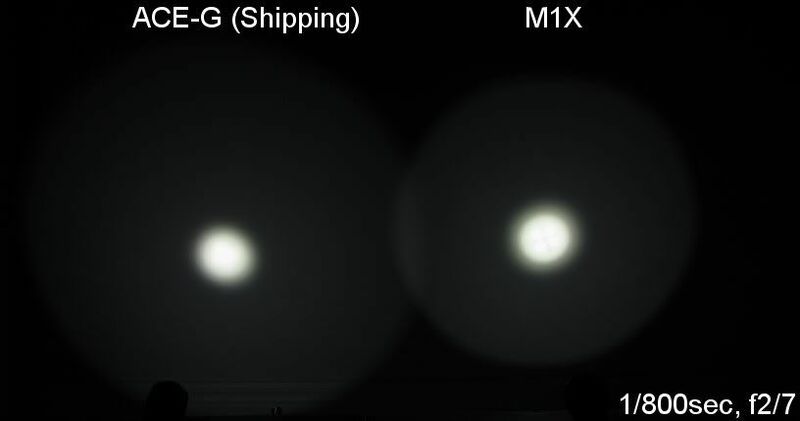 This makes the M1X the first continuously-variable M-CE light in my testing. The original IBS lights were Li-ion only and had 3 separately programmable output modes (each accessed in sequence by a soft-press of the reverse clicky tail switch). 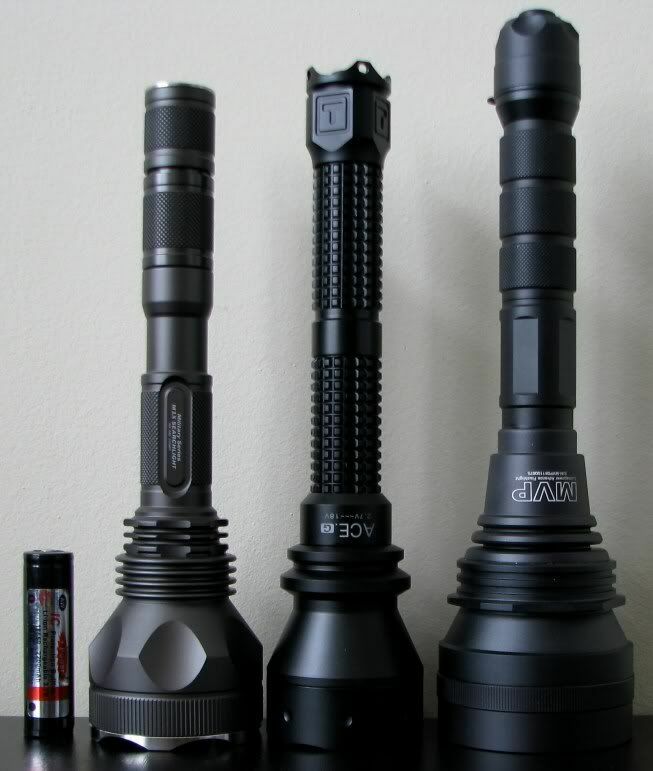 They could be set to any output along the continuously-variable range, or set to one of many SOS/strobe modes. The revised Jet-III M broad-voltage circuit was multipower (up to 15V) and has two output states - Max output (head fully tightened against the body) and one programmable output mode (head slightly loosened). Programming of the set-able mode was slightly altered to account for the new forward clicky switch (the original IBS lights were designed to work with a reverse clicky). The M1X uses a variant of the new broad-voltage circuit that is multipower (from 6.5V up to 18V in this case), allowing you to run 2x18650, 3xRCR/CR123A, or 4xRCR/CR123A. This differs a bit from most of the other M-CE or P7 offerings, which are typically 2x or 4xRCR/CR123A (although often without full power on 2xCR123A). From the head loosened position, you can access the "Brightness Setting" mode of the M1X by rapidly pressing the clicky 3 times within one second, then holding the switched half-pressed or fully click to start the output ramp (the light should be off to start, if you want to program). To select the output level you want, simply release the switch or click off when it reaches the point you want. Wait at least 2 secs for the light to memorize your setting before attempting to turn it back on. 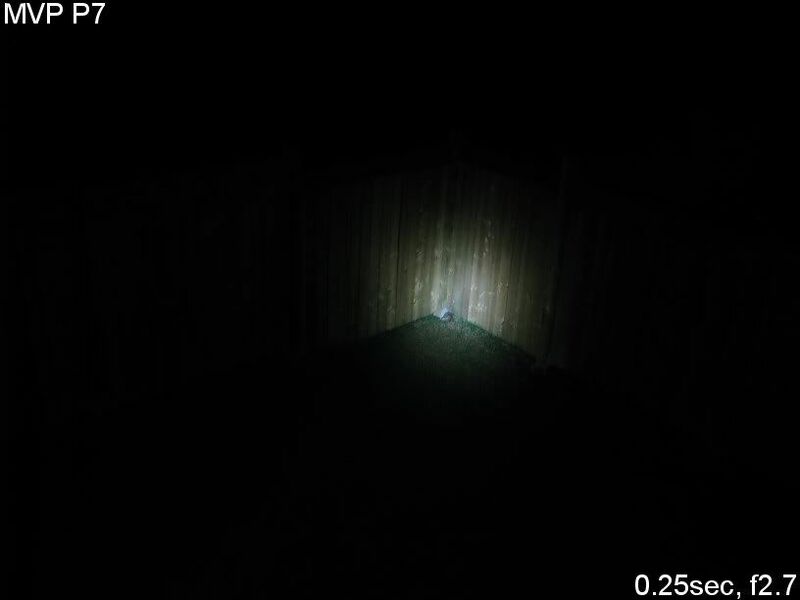 To access the SOS/strobe modes, flash the switch during the brightness ramp. This will advance you to "Special Functions" mode, which contains a number of SOS/strobe modes. If you flash again while in the Special Functions mode, you will advance to the Reset Function mode. This doesn't have much use now, as it was designed for the original IBS circuit where it reset all 3 programmable modes to factory defaults. Simply flash again to get back to the Brightness Setting mode. Note that the manual that came with my sample is rather insufficient - it is not specific for the M1X, but is a general "Military series" instruction booklet that simply explains the interface (but provides no details about the build, what battery configurations are acceptable, etc.). Worse, this booklet seems to be a hold-over from the first batch produced for the Jet-III M that mistakenly repeated the "Brightness Setting" section text under "Special Functions". I'm hoping JetBeam releases a properly configured manual to accompany the shipping lights. 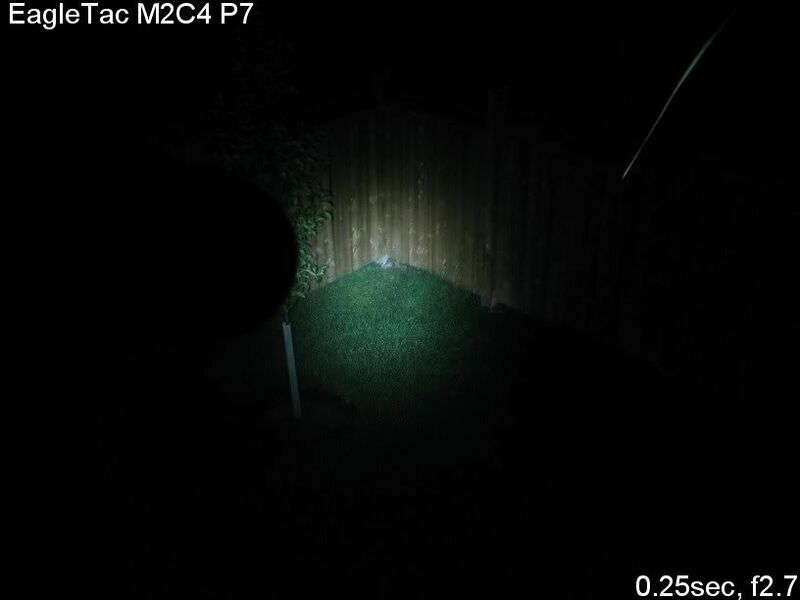 As with all JetBeam IBS lights, PWM is used for the continuously-variable modes - but at a sufficiently high frequency that I cannot detect it by eye or measure it with my setup. 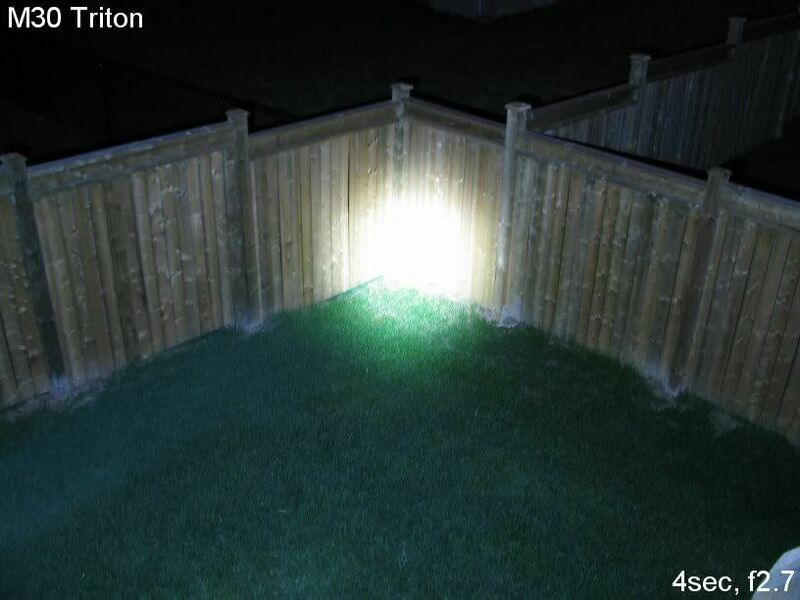 Both lights are on 100% on 2x18650 AW protected Li-ion. Distance is about 0.5 meters from a white wall. 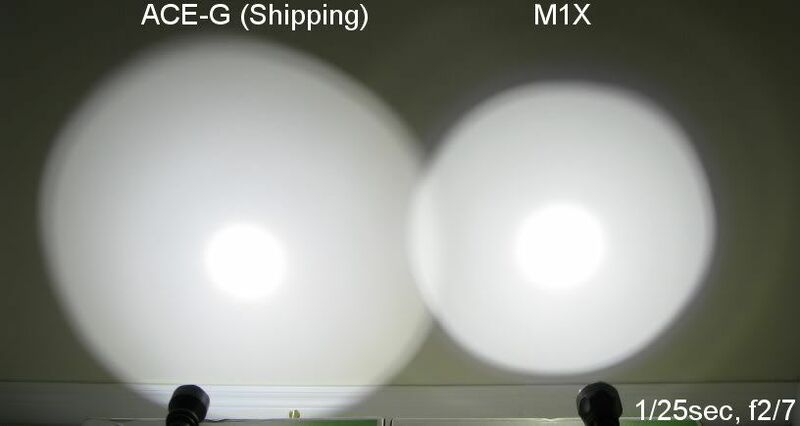 As you can see, the M1X has a narrower spillbeam than the ACE-G, and greater throw. It also has the typical center-beam "donut" hole, like my MVP P7 (which otherwise has a spill profile closer to the ACE-G). 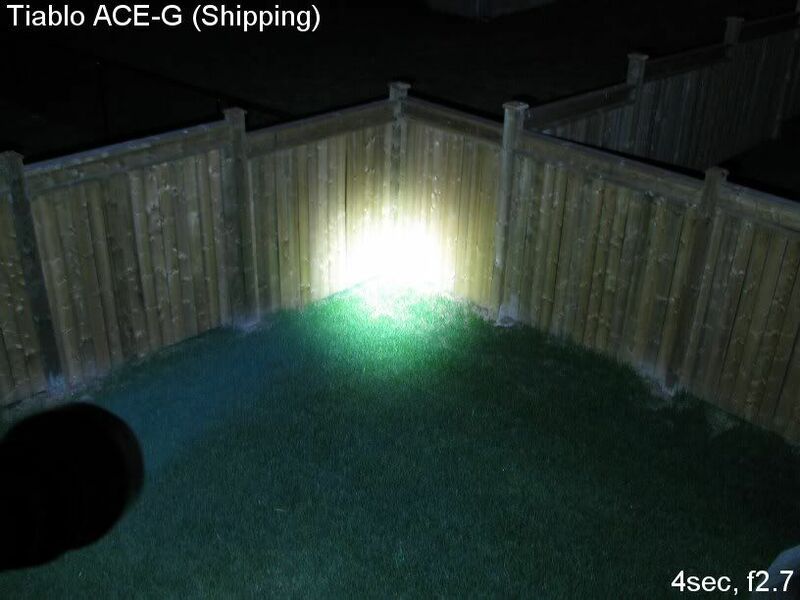 This is quite common on quad-die lights - the shallow reflector ACE-G is the exception in minimizing its effects. UPDATE Oct 23, 2009: Here are some outdoor shots focused on a point ~30 feet from the lights, with some of the newer competition added. 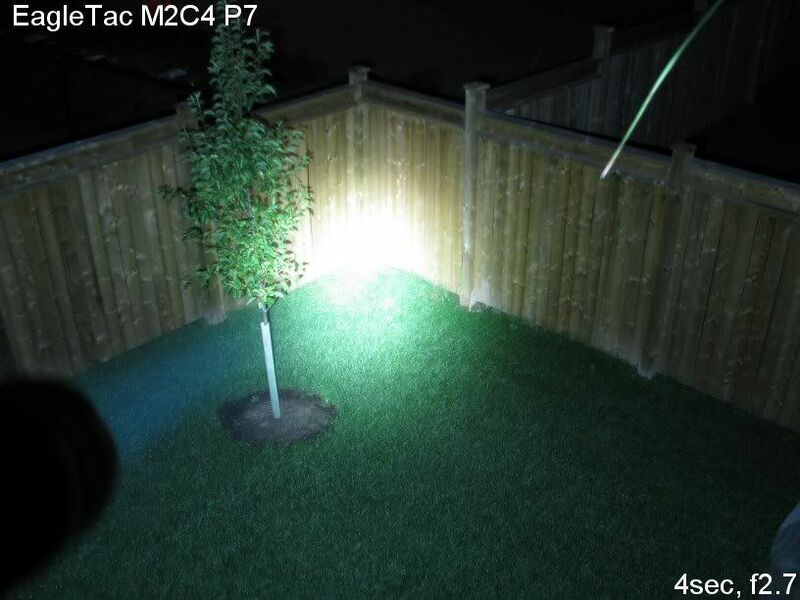 For comparison to the older lights like the M1X, please note that I have since planted a tree in my back yard. These pics are a bit misleading. Some of the competition fully light up my yard, which is wider than the camera's field of view, thus resulting in a dimmer appearance in the narrower view frame. On the other hand, the M1X is more focussed for throw than the other lights, so a lot of the overall output is directed to the centre-beam. As you can see, the M1X has the brightest hotspot of the group. What you can't see so well is the donut hole on most of the P7/M-CE lights. 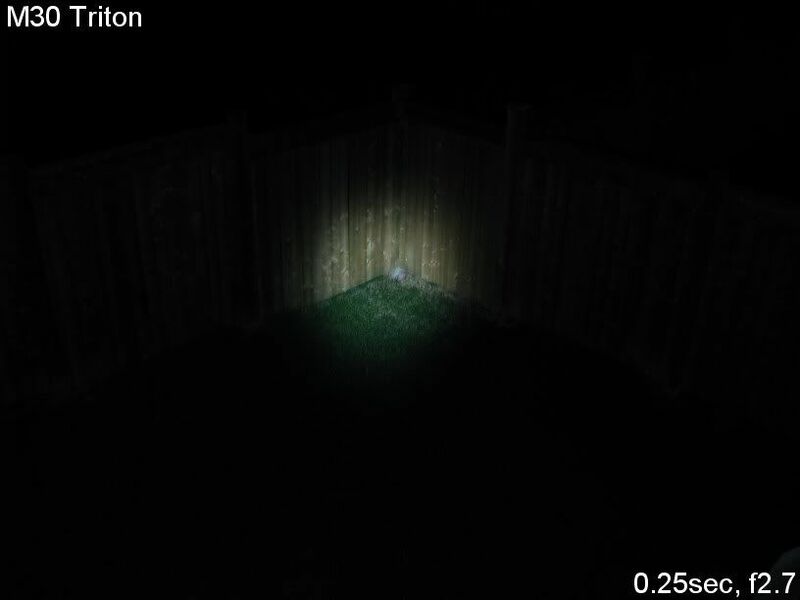 But this is consistent with real life - you only really notice it when shinning on a uniform surface. Throw values are the square-root of lux measurements taken at 5 meters from the lens, using a light meter, and then extrapolated back to estimate values for 1 meter. 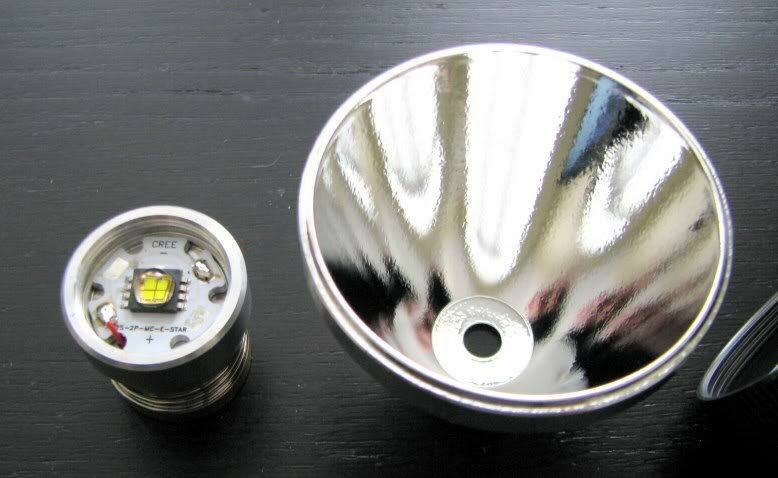 With these new breeds of high-output throwy lights, I don't believe measuring raw lux at 1 meter means a lot any more. The beams don't really have a chance to fully converge until typically several meters out, so what I've done below is taken readings at 5 meters and worked back to a calculated estimate of throw/lux at 1 meter. This will be my standard way to present throw on these types of lights from now on. The M1X takes a few minutes to reach its fully-regulated output level (see runtimes below). As such, all throw and output measures are taken after 2 mins of continuous runtime for all lights (2x18650 AW Protected cells). Ok, we have a throw winner here - the M1X rivals many of my dedicated 1x18650 throwers such as the RaidFire Spear and Tiablo A9. 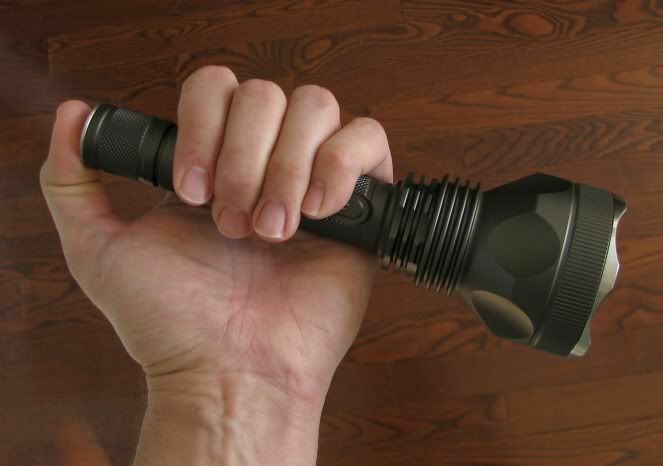 To put it mildly, that's *very* impressive for a quad-die M-CE light. Note again that my measures are taken from the centre of the beam - given the noticeable "donut" effect, the corona would be even brighter. 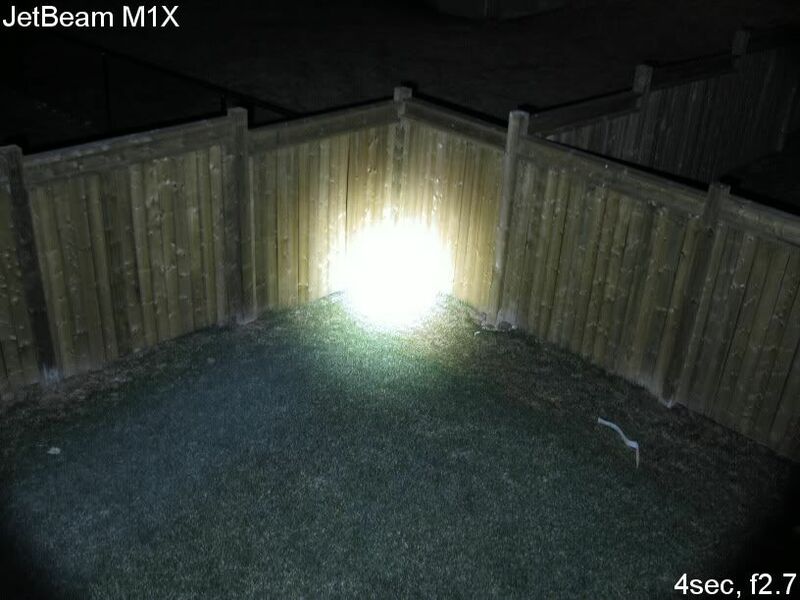 JetBeam isn't kidding when they called the M1X a "searchlight"! Note that while the raw Lux numbers for the M2XC4 cool are higher than the M1X at 5m, I suspect you will find the M1X throws further in the real world (i.e. 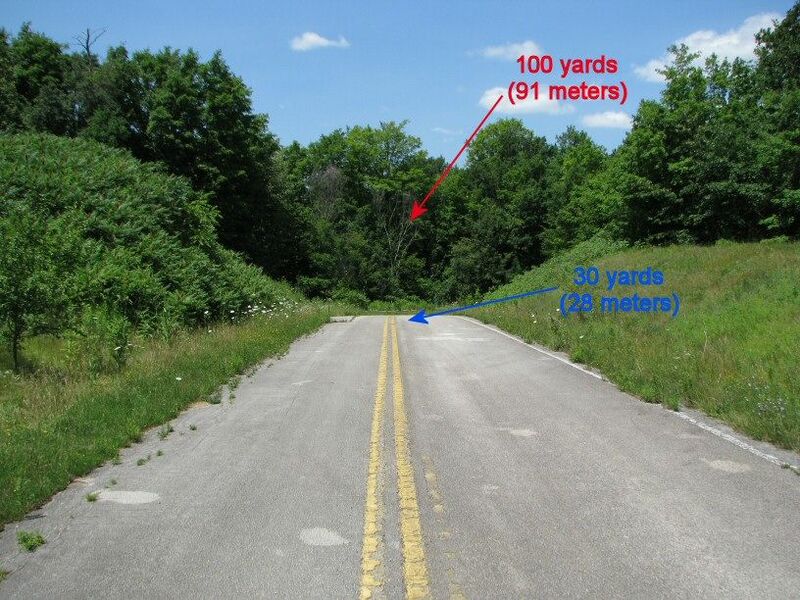 will better illuminate a target at greater distances). 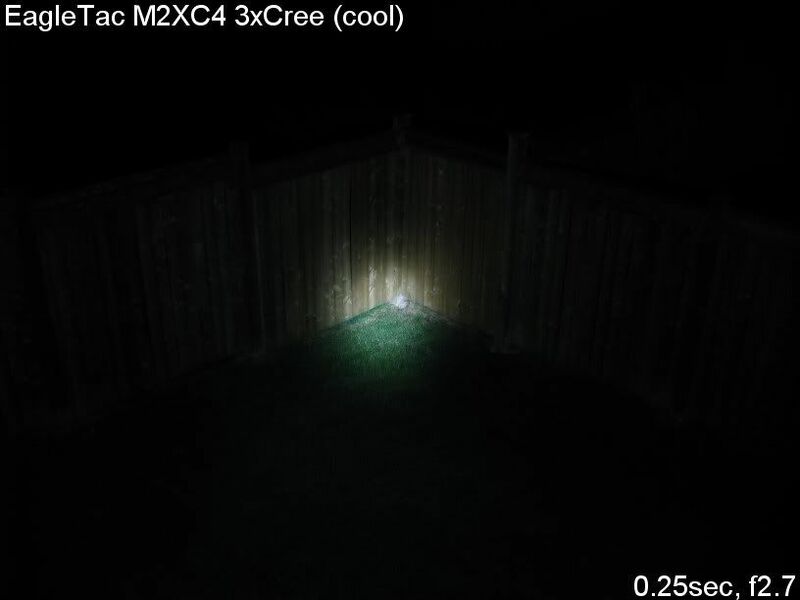 The smaller individual reflectors on the 3xCree M2XC4 for just can't compete with the larger focused reflector of the M1X at greater distances. 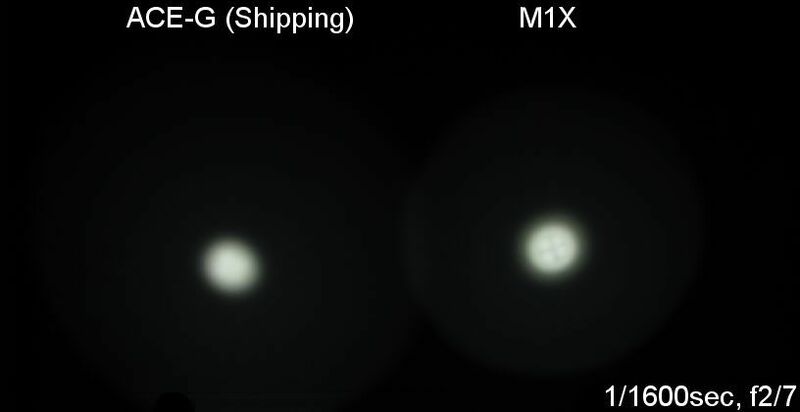 The center beam doughnut of the M-CE on the M1X is likely reducing its raw Lux throw numbers at 5m, artificially making it seem like it has less throw. I've only done runtimes on two output settings so far - Max and ~50% (as determined by my lightbox). Output is the same on 2x18650, 3xCR123A, and 3xRCR at all levels - the only difference is in runtime. The Li-ion battery sources are fully regulated, and the primary CR123A tests show a typical regulation pattern followed by slow decay. Runtime efficiency appears to be as expected, and I don't see any surprises in the results above. UPDATE May 2, 2009: Added runtimes for Max on 2x18500 (AW protected). Runtime is an impressive 1hr 8mins on these cells (rated at 1500mAh each). UPDATE June 8, 2009: I've just updated the graphs with 4xCR123A runtimes for all lights that support this configuration. Also included are some recent additions to the multi-emitter class that I have recently reviewed. UPDATE Oct 23, 2009: Runtimes for the competition on 18650 have been added. So how does it stack up to the competition? In a word - very well! (ok, that's two words ). UPDATE 10/23/09: Even with the newer lights shown above, the M1X remains a very good performer on Max on all battery sources. Keep in mind that the various battery configurations when comparing the graphs above (i.e. M1X is using 3x or 4xCR123A/RCR, whereas some as 2x or 4x, etc.). As for the ~50% output level, performance is certainly very respectable. Note that the M1X is a continuously-variable light, which will never be as efficient as a good defined multi-level current-controlled light. Despite this, you can see the M1X performs very close to the earlier MVP 3XCree on Med on 18650. 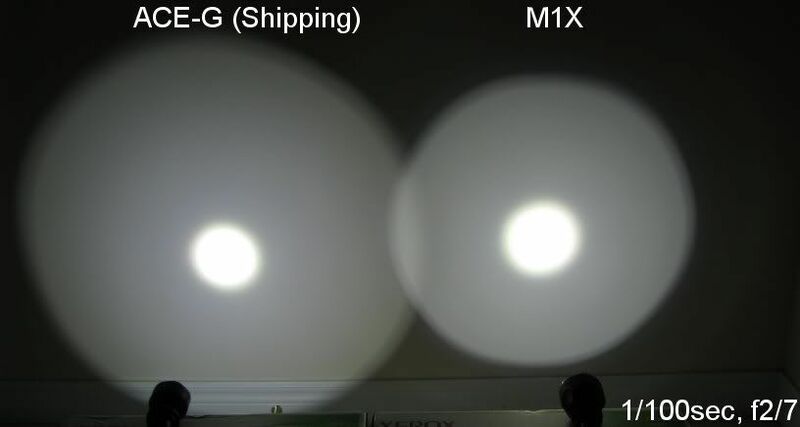 Oh, and in case you are interested, the M1X also has the lowest possible output of any light of this class. As you can see, the ramping sequence is virtually identical to the Jet-III M (which uses a similar broad-voltage IBS circuit) - it is just more than twice as bright! Like the Jet-III M, total ramp time on my sample was a little over 35 secs, which is longer than typical for a continuously-variable light. Note that the manual continues to incorrectly state the ramp is only "8 seconds" long. 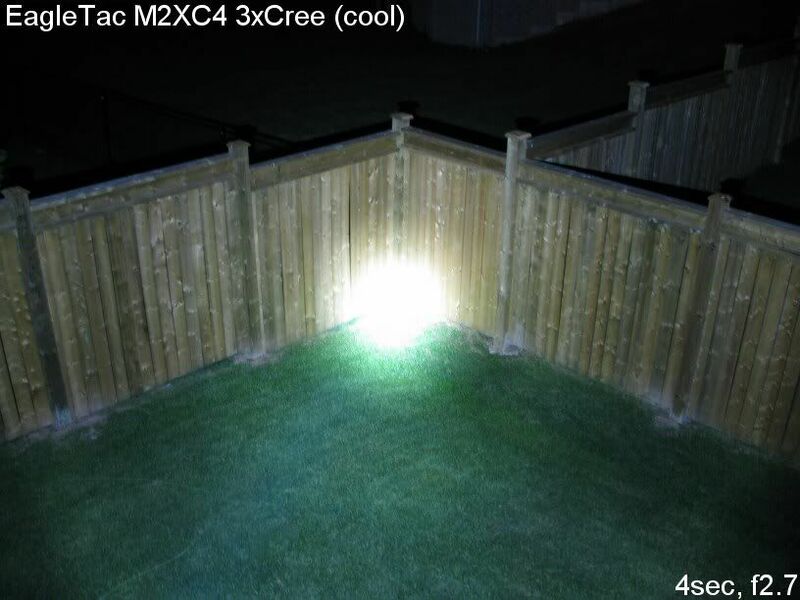 Light has the typical M-CE centre-beam "donut" effect. Manual is non-specific and not sufficiently detailed. Output ramping time remains longer than most continuously-variable lights (i.e. over 35 secs). You may go blind if you stare directly into the light. (just having a little fun here - there really isn't much else that I can find fault with). As you may have guessed by now, I'm impressed with this M-CE offering from JetBeam. The M1X hits hard on all cylinders - good solid build, minimal weight and size, smart selection of battery choices, excellent interface with continuously-variable output, and the furthest throw and one of the highest max outputs among all the members of this class that I have tested to date. The voltage range and selection of battery sources is particularly interesting. Although most makers have opted for a simple 1x18650 (2xCR123A/RCR) base with an extension for 2x18650 (4xCR123A/RCR), the reality is that 1x18650 or 2xCR123A/RCR is generally too underpowered for reasonable performance on these multi-emitter lights - leaving you really with only the extended size mode to play with. By forgoing the 2xCR123A/RCR size and starting from 3xCR123A/RCR, you can actually run the M1X on all battery sources reasonably well. I don't have any 18500s to test, but I imagine 2x18500 would work in the 3x base format. UPDATE May 2, 2009: Indeed they do - just added the runtime for 2x18500 (AW protected, 1500mAh). At 1hr 8min on these cells, they are definitely a very feasible option. Of course, this light may not be suited to everyone. Consistent with its "searchlight" label, it is a very strong thrower (and one with the typical M-CE centre-beam "donut"). 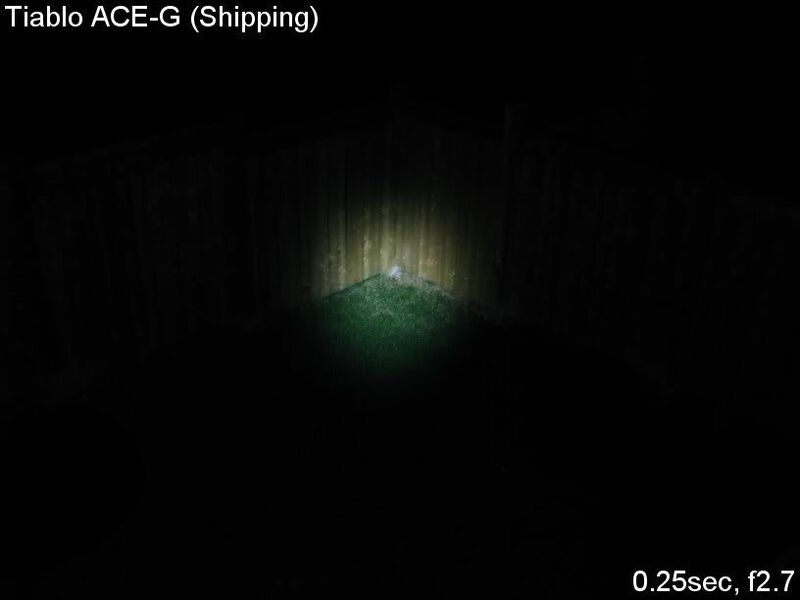 If you are looking for a smooth flood beam, you might want to check out my recent Tiablo ACE-G review (assuming you don't mind the single output level on that light). But it's hard not to be impressed by everything the M1X has to offer. I think a key point here is that JetBeam is working from an established base build that has already seen a lot of the kinks worked out. They aren't re-inventing the wheel - by adapting their mature broad-voltage IBS circuit and robust Jet-III M body design, they've been able to capitalize on their previous successes. Coupled with a rather unique new reflector design and a selection of smart battery options, the M1X is a very strong contender indeed. 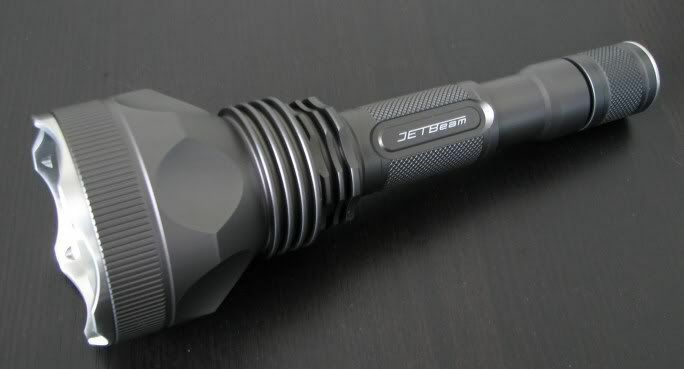 I am also impressed that JetBeam has conservatively cited the lowest "torch lumens" (450 lumens) of any multi-emitter setup, despite being as bright as much of the competition. 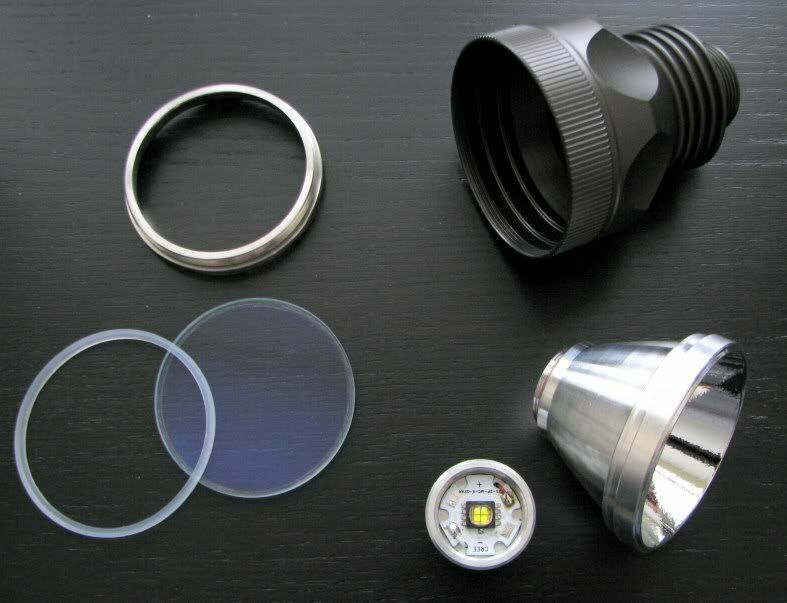 Coupled with their careful attention to detail in the build, circuit, and reflector design of this light, it seems they are clearly thinking ahead to the long-haul, and not just trying to make a quick flash in the pan. 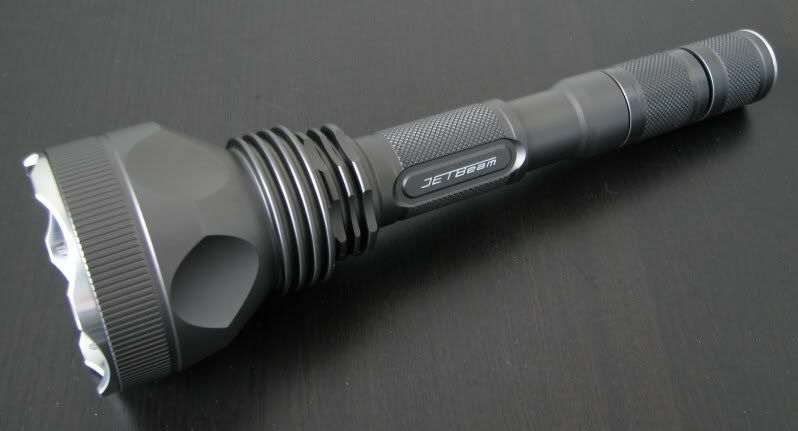 I hope this light becomes a staple of their ongoing production lines. Given all the M1X strengths, I would like to see some improvements in the presentation. 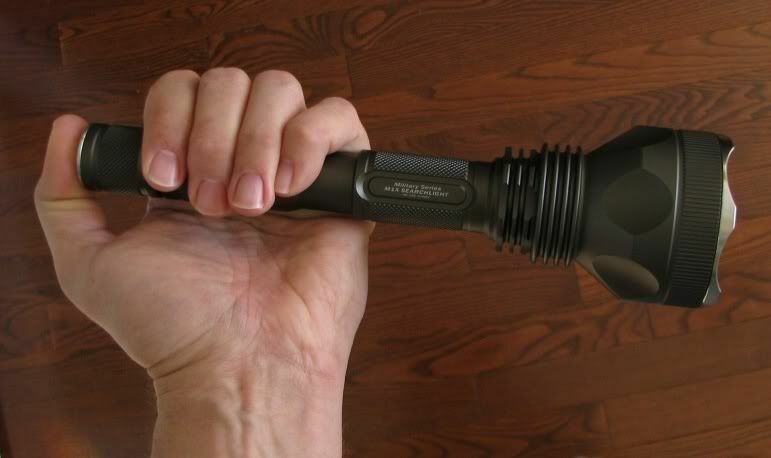 A proper manual specific for this light needs to be developed. And the quality of components cries out for a good quality carrying case, holster, or something to help you carry this thing around. Given everything it has going for it, you are going to want to have it with you. UPDATE Oct 23, 2009: I have found the Stallion half-holster does a serviceable job of holding the light, but it does leave the head exposed (and feels a little wobbly). For a covered holster, Ryanrpm reports that the Sunlite 16w Far Projection holster is a perfect fit. Bottom line, existing JetBeam fans will find much to like in this new offering. 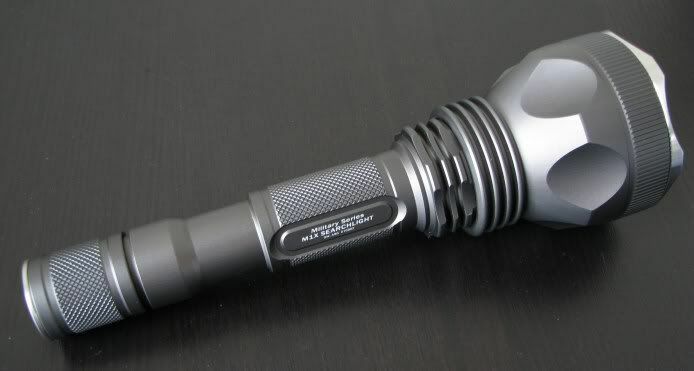 And those looking at taking the plunge into the multi-emitter flashlight space would be well advised to give this model serious consideration. UPDATE Oct 23, 2009: Six months later, I remain just as impressed with the M1X. Although some of the newer lights are a bit brighter on Max and potentially more efficient at lower outputs, the build quality, throw, low output level, UI and battery versatility of the M1X remain hard to beat. This light is a definite winner for JetBeam. 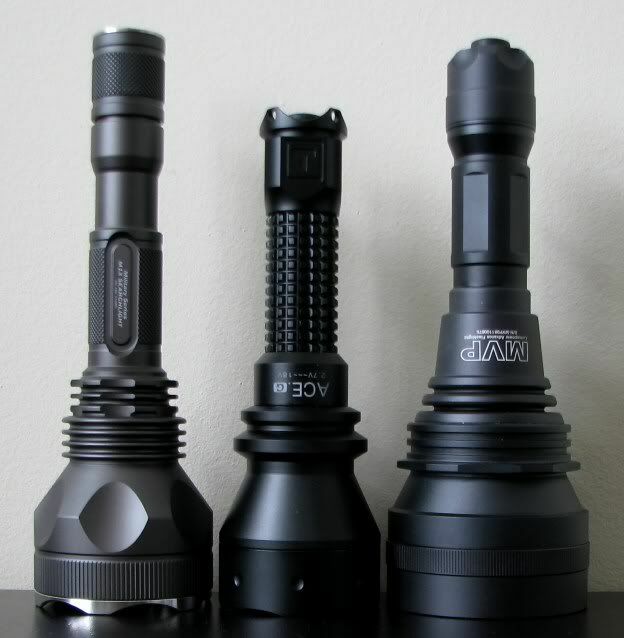 Check out my master list of flashlight reviews for detailed reviews of some of the newer competition cited above. To follow the online discussions for this review, please see the full review thread at CPF. Return to the master review list (at flashlightreviews.ca). For cash donations, please use my personal Paypal account (note that ONLY cash transactions are possible on this account). For all credit/debit card donations, please use my regular Paypal account. All material © 1999, 2011 by Eric Marcotte.